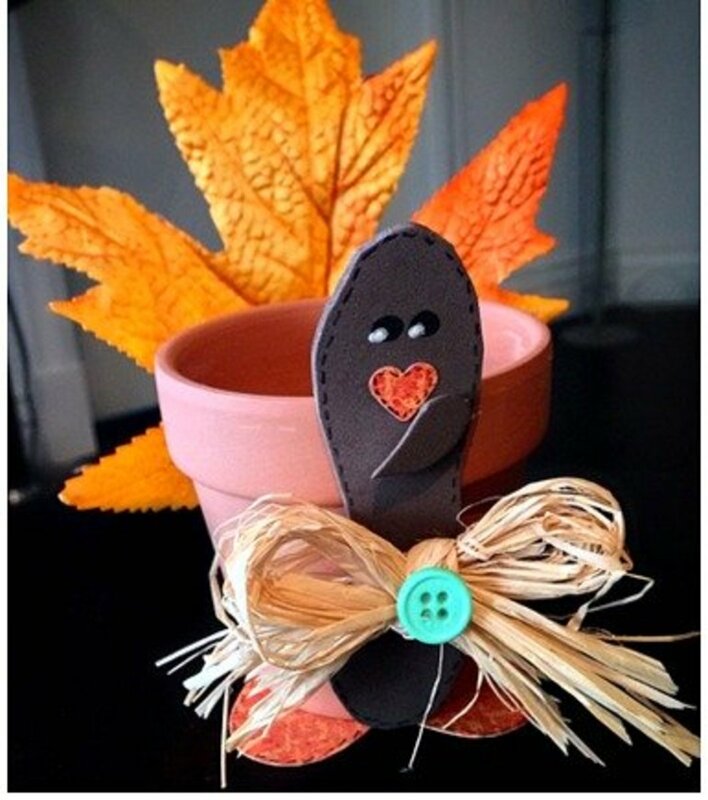 Making clay pot crafts is not only easy and inexpensive, but you can find projects suitable for every season and holiday. You can make Santas and snowmen for Christmas, bunnies and baskets for Easter, mummies and monsters for Halloween and scarecrows and pilgrims for Thanksgiving. 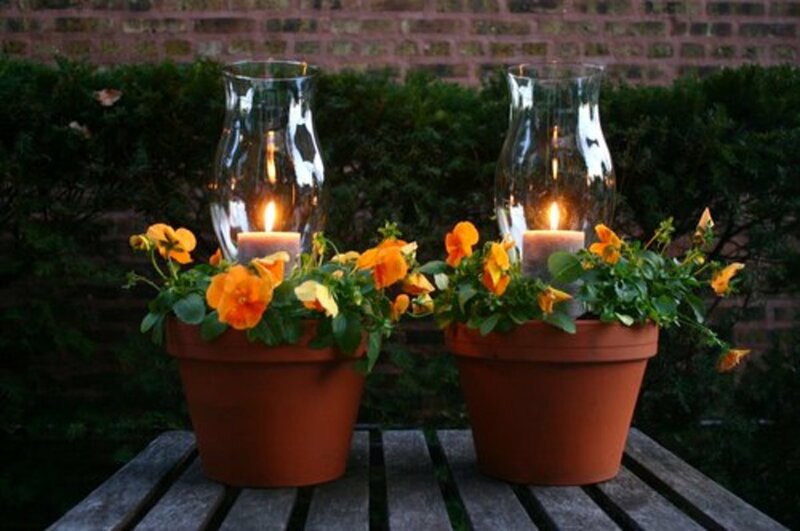 All the projects found in this article include a nice picture of the project and the site where you'll find the instructions to make it.To make the beautiful potted candle planters shown above, go to Family Chic for the instructions. Making simple spring bugs is so easy that the kids can almost make them alone. To find the directions for this project, go to HECK FRIDAYS. 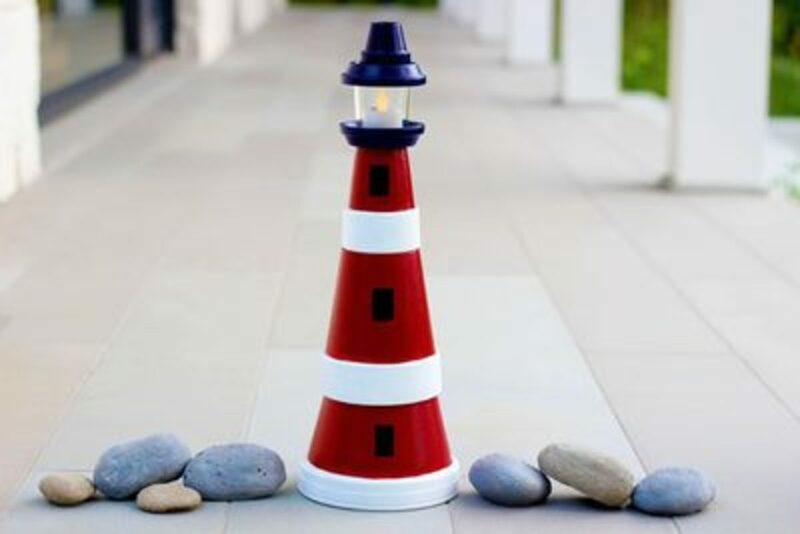 This lighthouse would be a perfect addition to your beach themed décor. You'll find the tutorial for making the lighthouse at eHow. 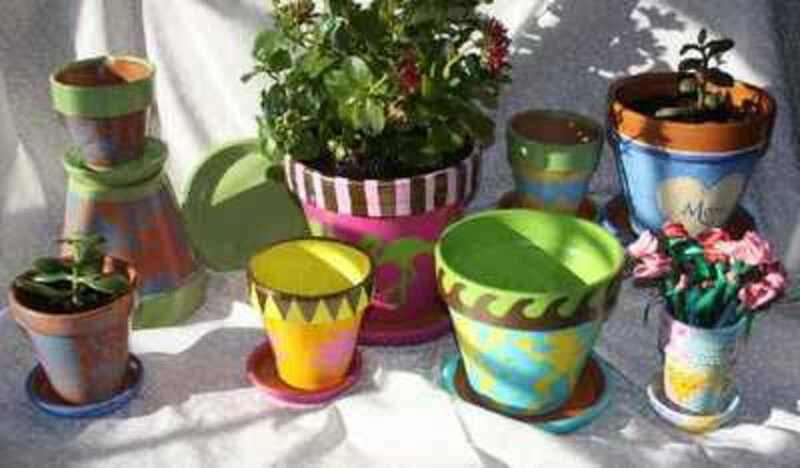 Imagine how many different looking flower pots that can be made with a little paint. 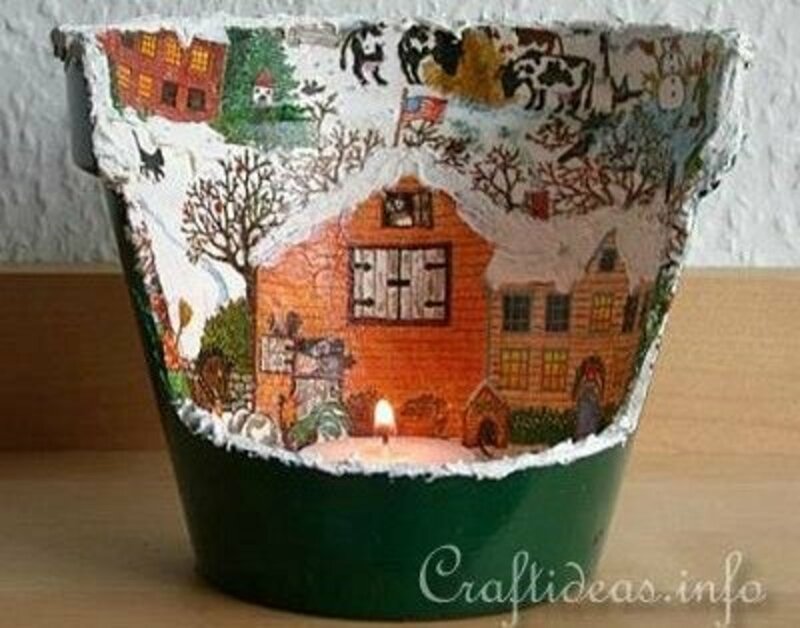 Be guided by your imagination and have lots of fun making unique decorator pots for your home. 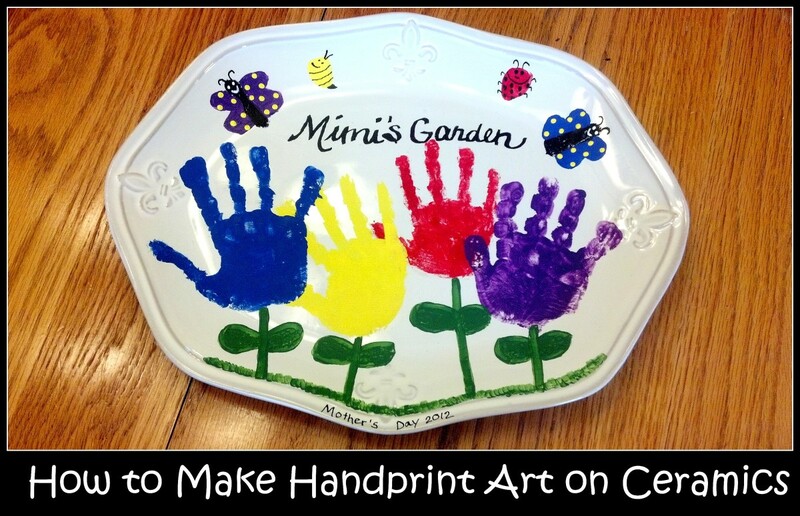 You'll find the instructions for making painted flower pots at CHILDREN'S ART. This is really a cool project. The tutorial at The Art of Doing STUFF gives easy to understand instructions. The site also gives information on making a patio lamp using a basket. Very impressive. This is a project that I'm really interested in making for my backyard. I find it very relaxing to sit on the patio to watch the gold finches feed at the feeder and to watch the birds at the birdbath. 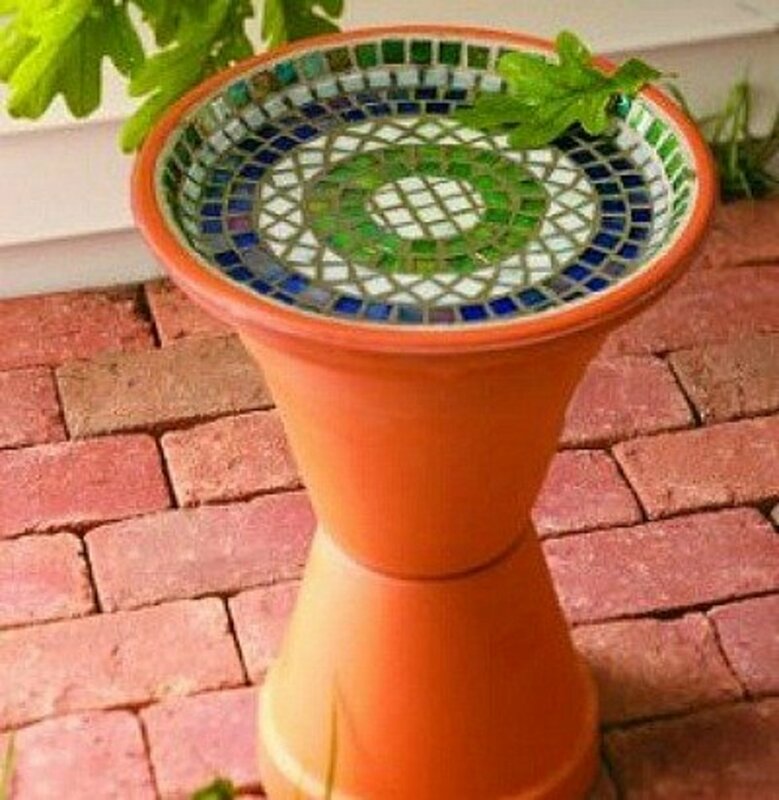 The tutorial for making this beautiful mosaic birdbath can be found at Birds & Blooms. The size of the clay pots that you use will determine how tall your Christmas tree will be. Use small ones to make a tabletop or mantel Christmas tree. 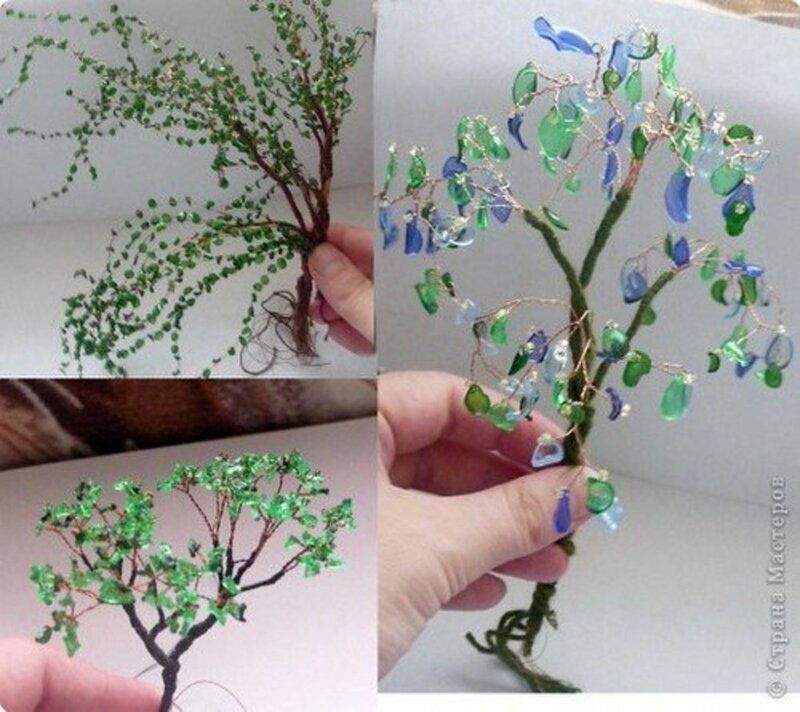 A nice tutorial is available at Crafting & Cardigans for making this tree project. 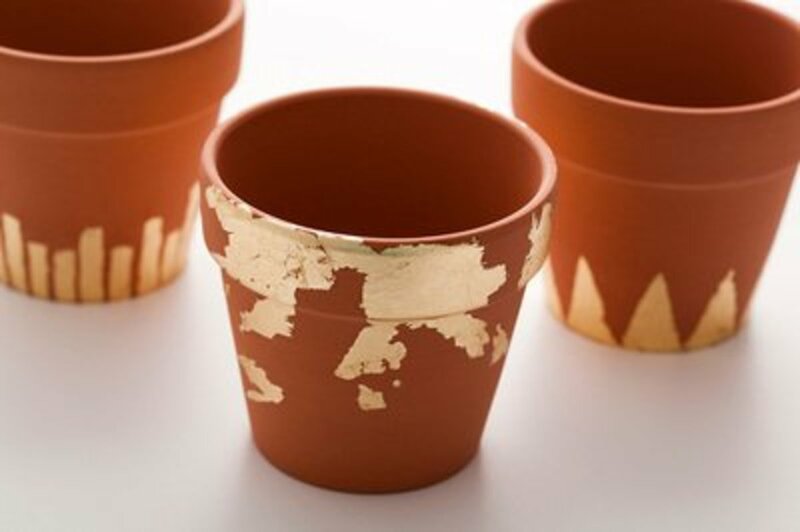 The beauty and simplicity of the gold leaf added to these terra cotta pots make an outstanding decorating statement. 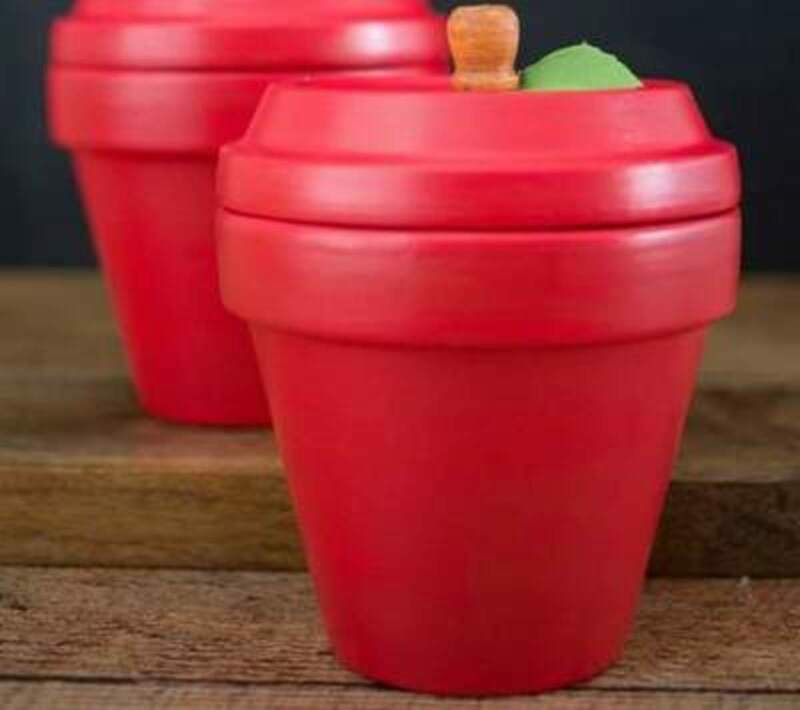 To make these easy and unique flower pots, go to BRIT+CO for the instructions. 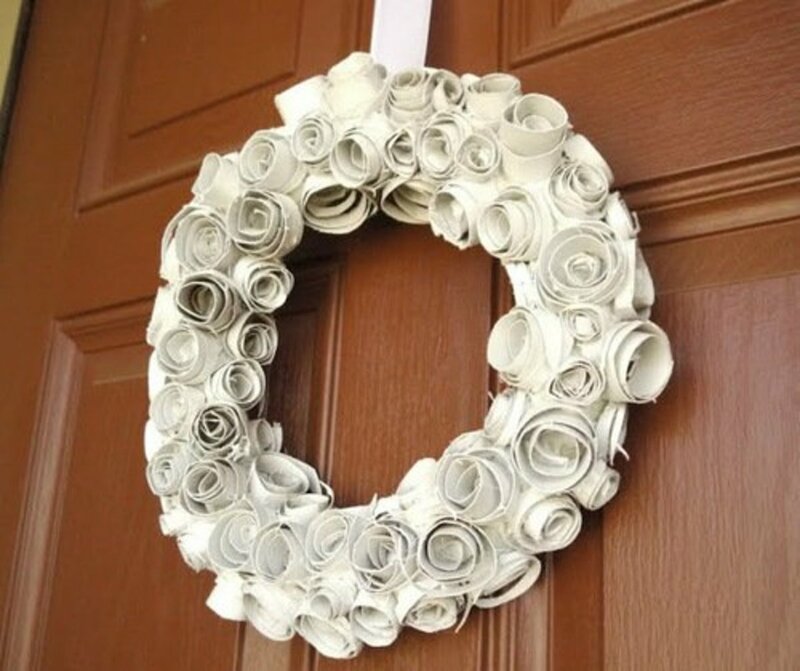 This is really a beautiful wreath. I love the shape of it. You'll find a really easy to understand tutorial for making this wreath at Sweet Pepper Rose.Notice the addition of the succulents. I have an old chandelier that I've been hanging onto just in case I'd see a craft idea for using it. It looks like this is it. I love the idea of painting it a bright color and hanging it on the deck. 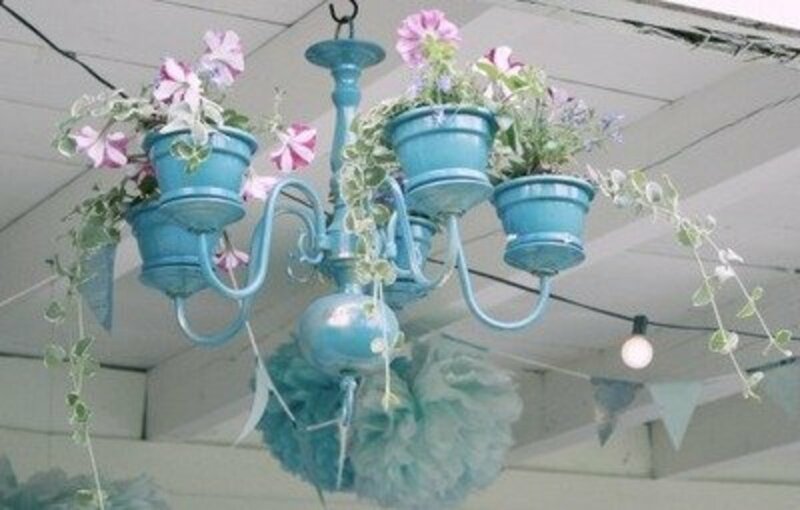 The instructions for making a planter from an old chandelier is found at DIY ShowOff . 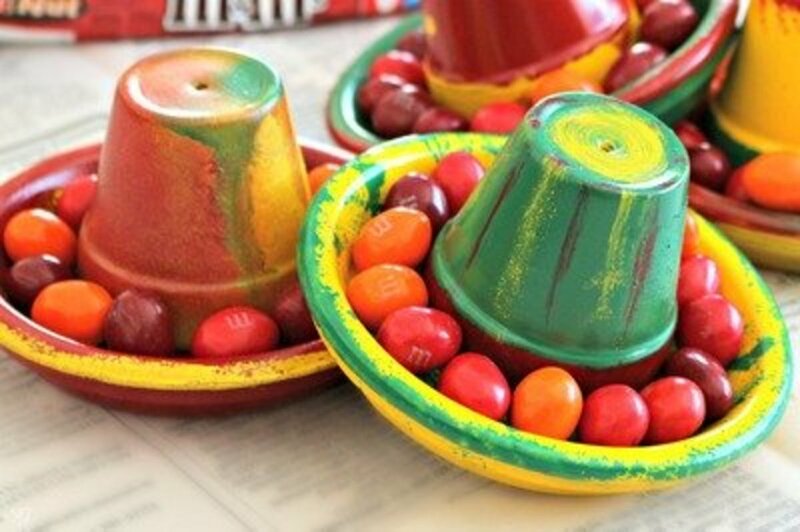 This simple to make decoration is perfect for Cinco de Mayo parties, or to use as a theme for a birthday party. Find the instructions at scrappy geek. 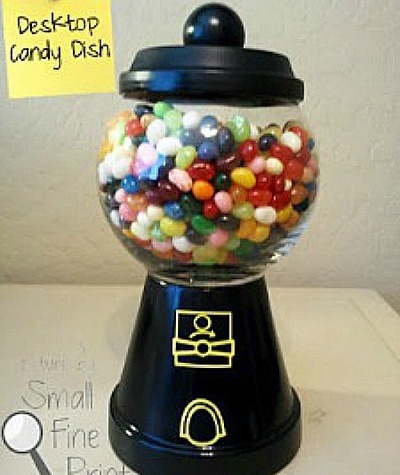 This really cute gumball candy dish does look like a gumball machine. You can make a candy dish like this by following the directions given at small fine print. Nice gift for any occasion!! 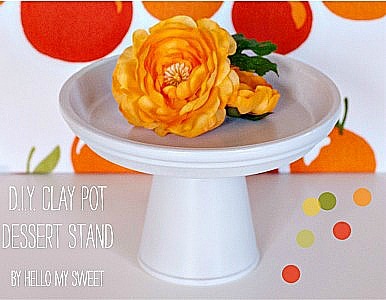 Be sure to go to the hometalk site for a better look at this centerpiece, and for the instructions on how to make it. This centerpiece could also be used to hold cupcakes, a collection of Christmas balls, etc. 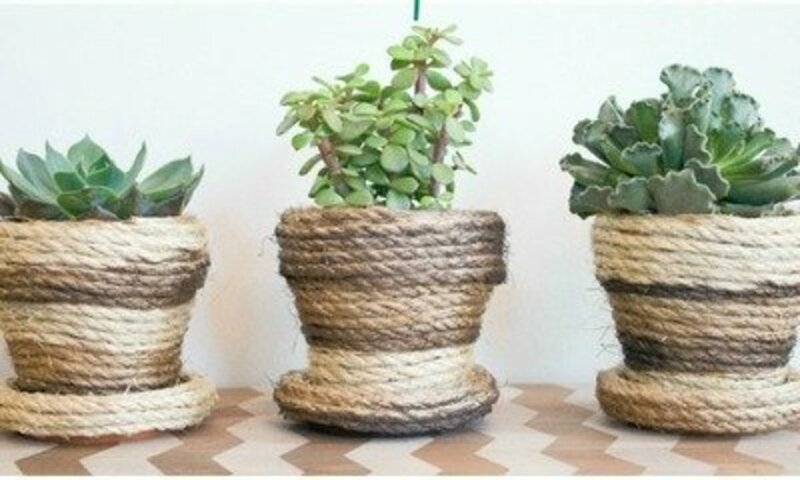 The sisal rope added to the clay pots makes these planters extra attractive. 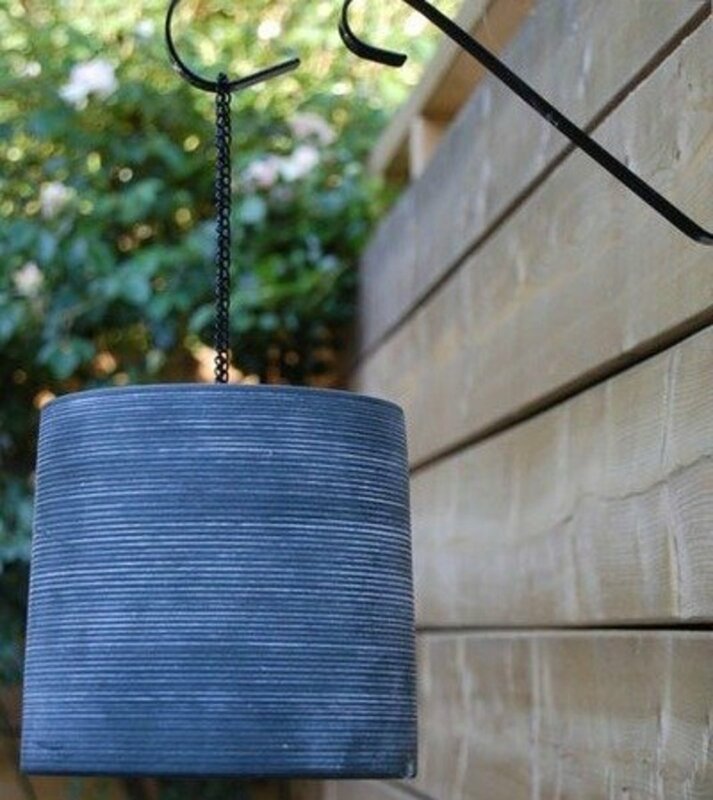 The instructions for adding sisal rope to the clay pots is found at DIY ShowOff. Easy, but so impressive! 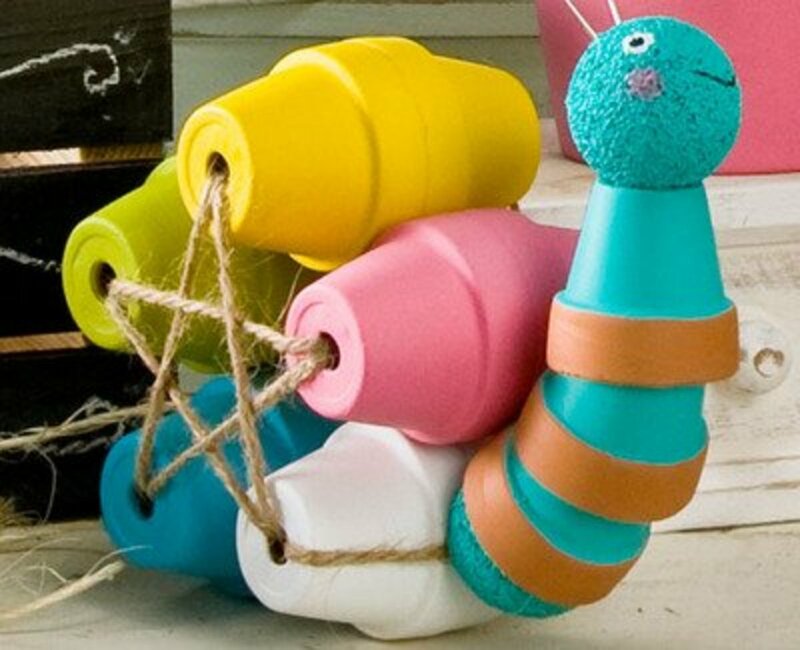 If you aren't lucky enough to have a broken clay pot for this project, you'll just have to break one because this project is too cute to pass up. The tutorial is found at Craftideas.info. Super simple, super cute! Even the little kids can make these turkeys, with a little bit of help. The instructions can be found at the crafty morning site. 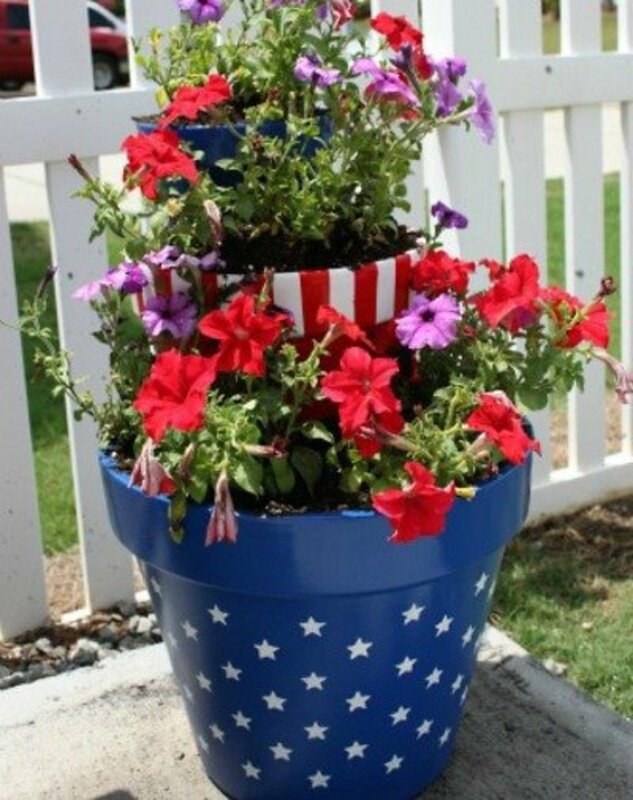 Show the neighborhood how patriotic you feel by displaying this planter on your front porch or in the driveway. Go to Wait ‘Til Your FATHER Gets Home for the tutorial for making the planters. 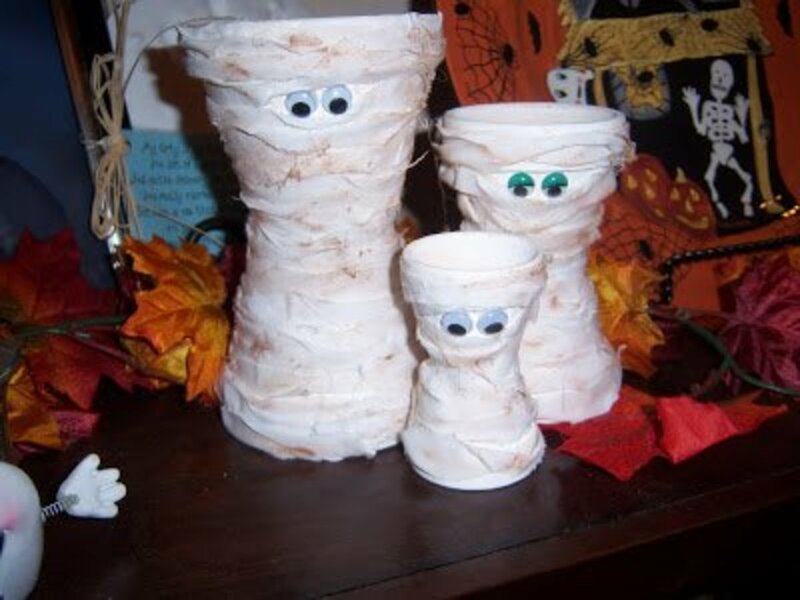 A perfect craft project for Halloween decorations to add this year. The easy to follow instructions can be found at Inspiring Creations. This looks like an especially great project for Halloween party decorations. When you do crafts, don't be afraid to use colors different than the ones suggested in the instructions.......give the project your own unique touch. Find the directions for making this outstanding snail project at PLAID. 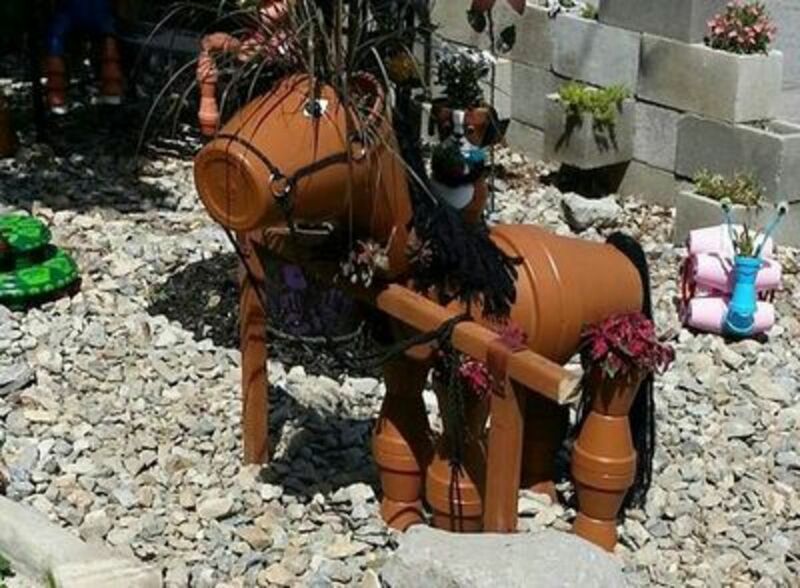 Find the instructions for making this clay pot pony at Ideas 2 Live 4. Another outstanding use for clay pots. Just sooo cute.....wouldn't these look cute in a baby's room? 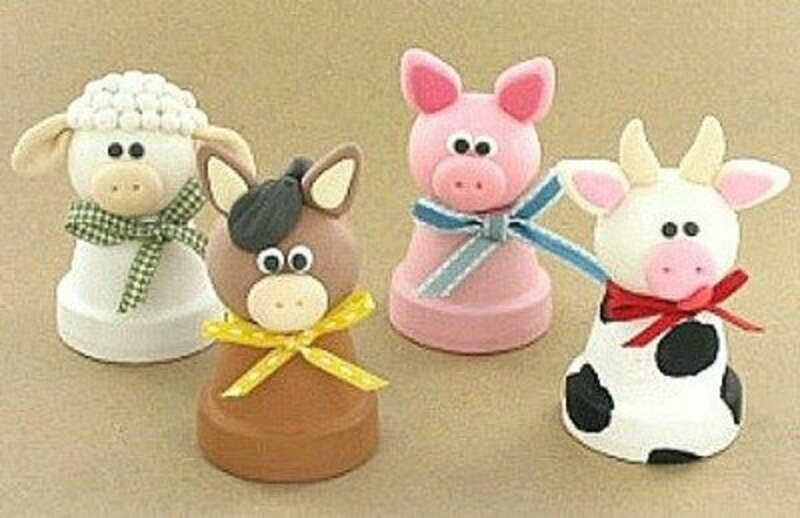 You'll come up with lots of places to use these little farm animals as you follow the instructions given at favecrafts. The Real Housemoms site is where you'll also find the instructions to make this apple container. Consider making apple jars in green and yellow also. 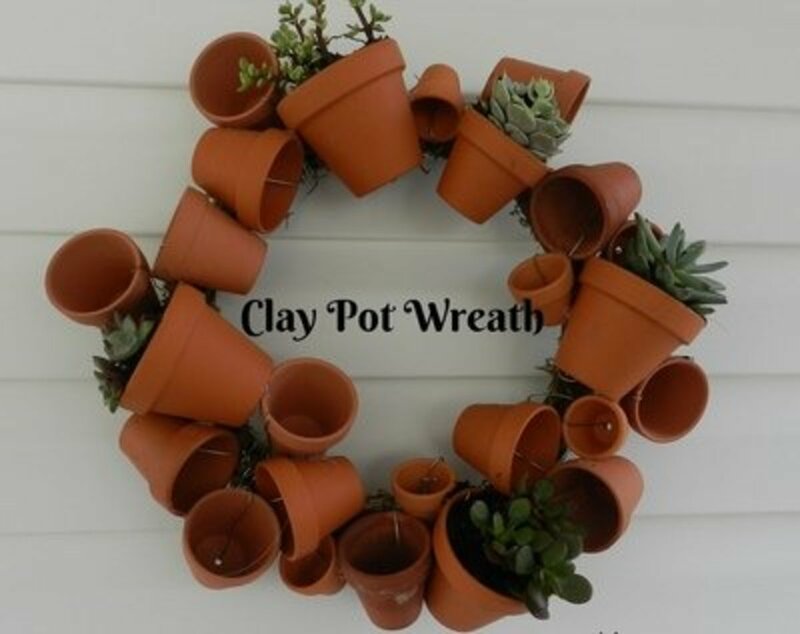 This plain clay pot wreath is beautiful, but I've also seen pictures where the pots are painted and flowers or little garden tools are included in the wreath. 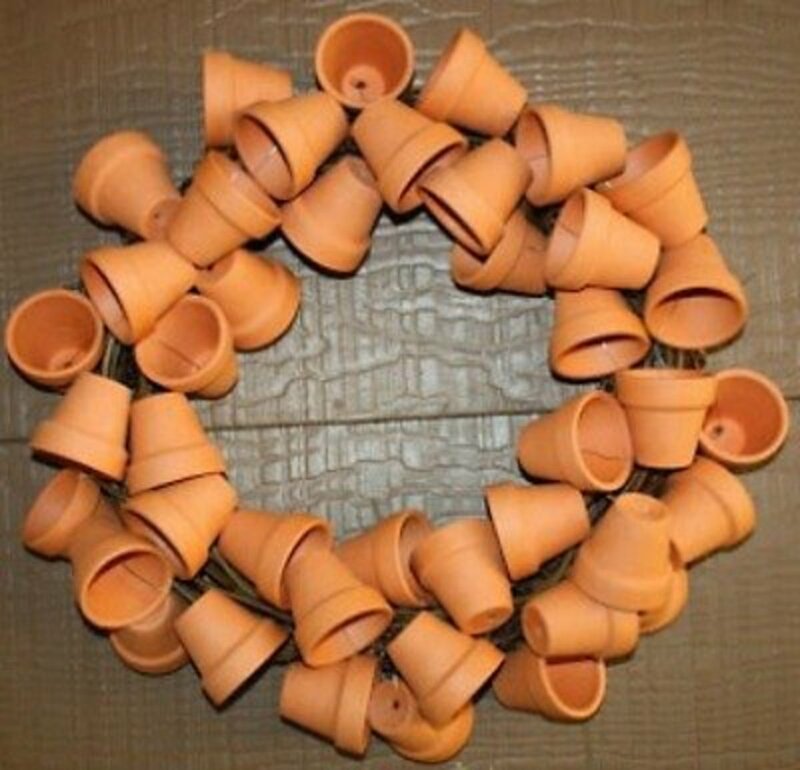 I can see the clay pots painted in Christmas colors, with little round bells wired inside the pots, to make the wreath look like Christmas bells. You'll find the instructions for making this wreath at from glitter to gumdrops. 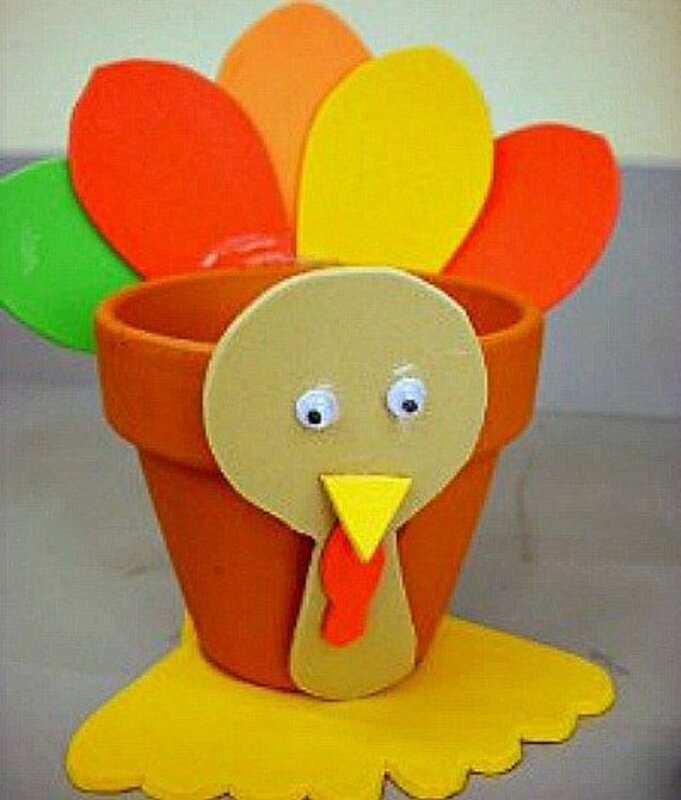 Have the foam sheets cut and the glue and eyes handy and then let the kids make their own turkeys. The cutest turkeys that I've seen had crooked tails and lopsided beaks. You'll love the creativity of the little ones. For the directions and patterns, go to The Creative Goddess. 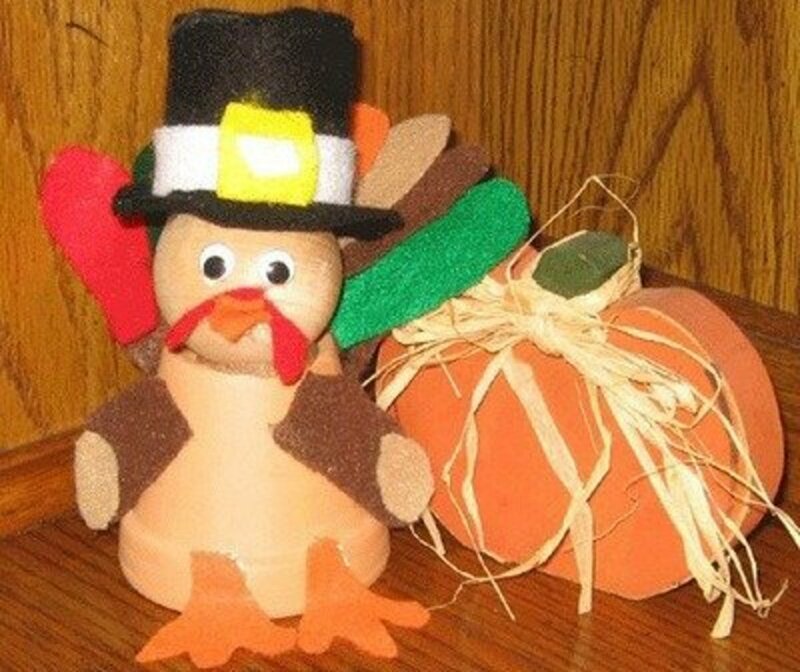 Maybe even add a cut-out pilgrim hat for the kids to glue on their turkey. 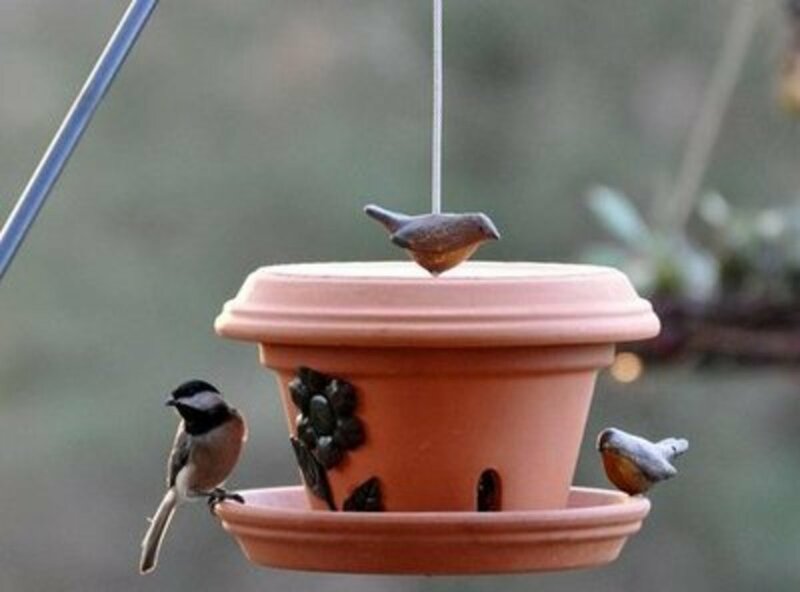 Make this bird feeder using clay pots and the tutorial found at The Garden Roof Coop. 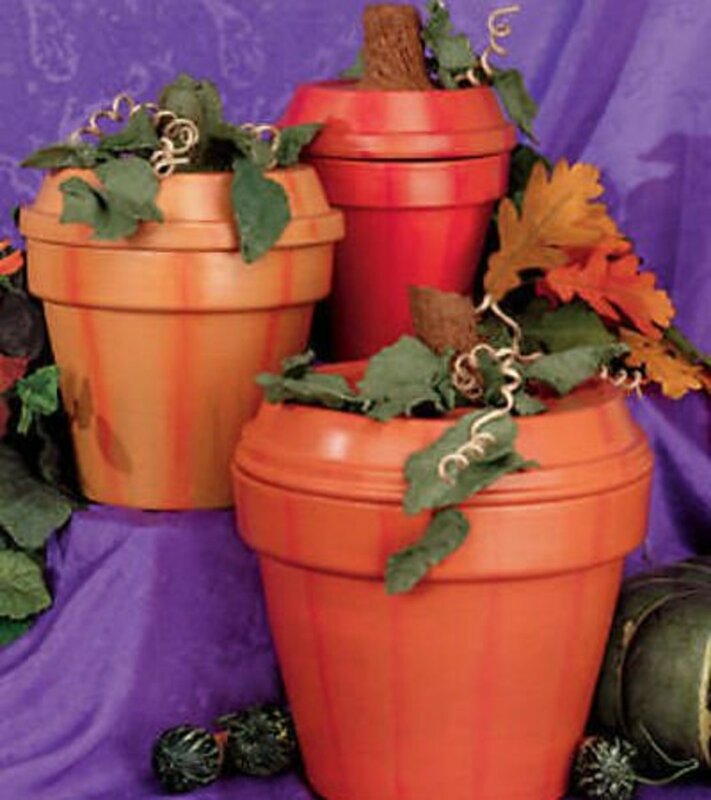 This is really a great pumpkin container that will look so nice with all your Fall decorations. You'll find the easy to understand instructions at Deco Art . 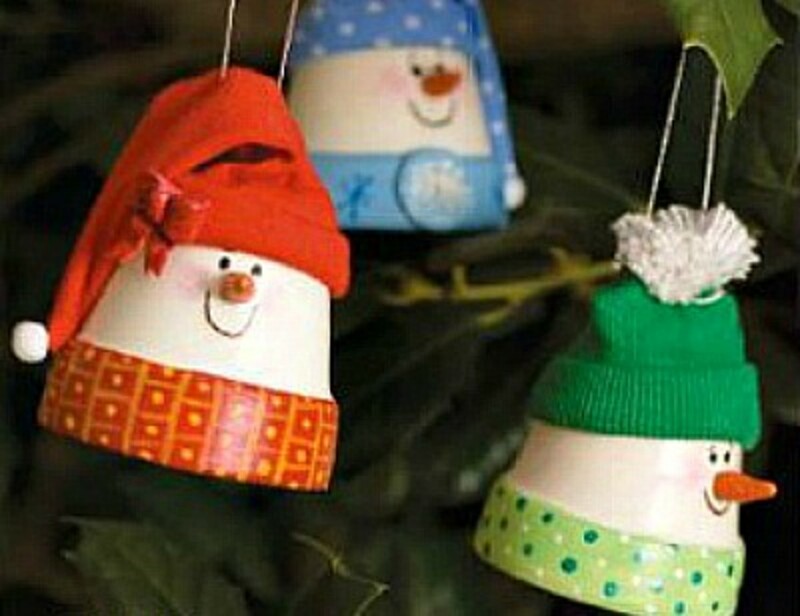 I think these little snowman ornaments are an outstanding craft that the whole family will love making. A few weeks before Christmas, how about having a "making our own Christmas ornaments" family night? It will give the kids memories that will last a lifetime. Find the instructions for making these snowmen at a squirrel knocks on my door. I love, love, love these little zoo animals. A great idea to use a zoo animals theme for a child's birthday party or baby shower. 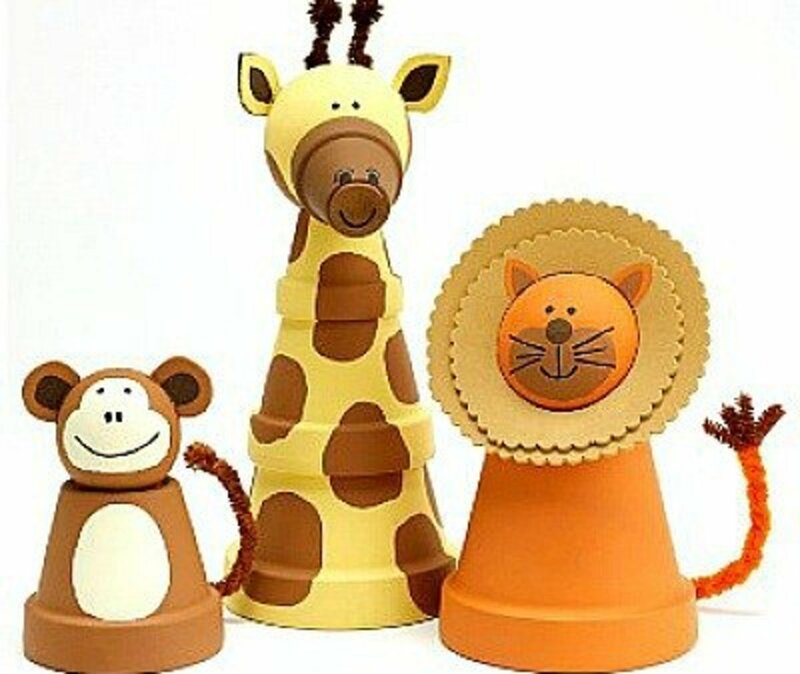 You'll find everything you need to know about making these clay pot animals at PLAID. The colorfully painted clay pots make this garden bell tower an outstanding attraction. You'll find easy to understand instructions at Garden Muse. 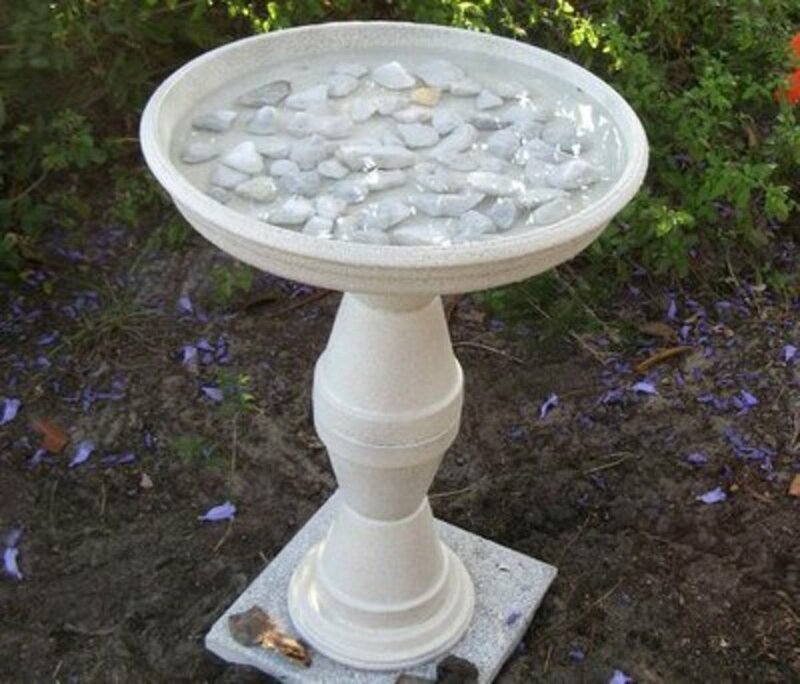 Make your own unique, one-of-a-kind birdbath by following the instructions given at OUR TREASURED HOME. Use colors and flower images that you love. 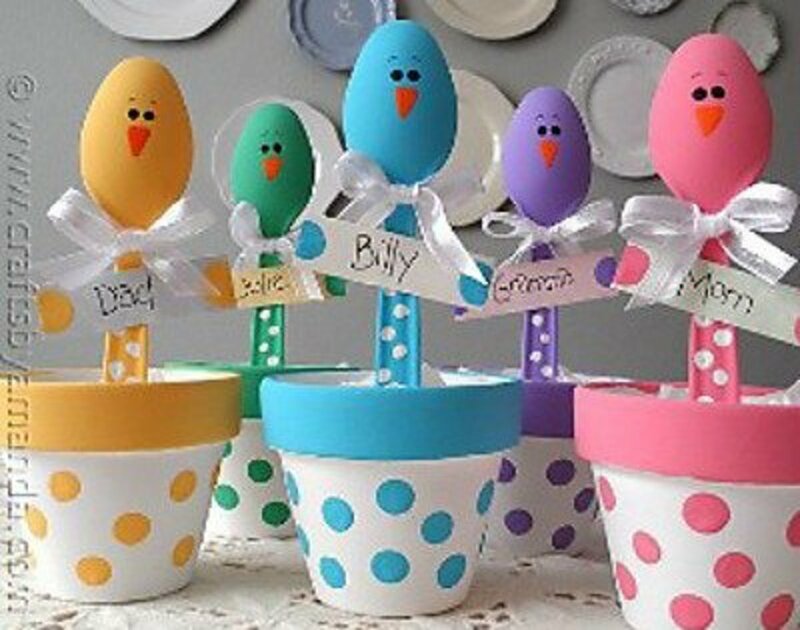 Plastic spoons and terra cotta pots are made into these beautiful Spring or Easter place holders. You'll find the directions at CRAFTS BY Amanda. 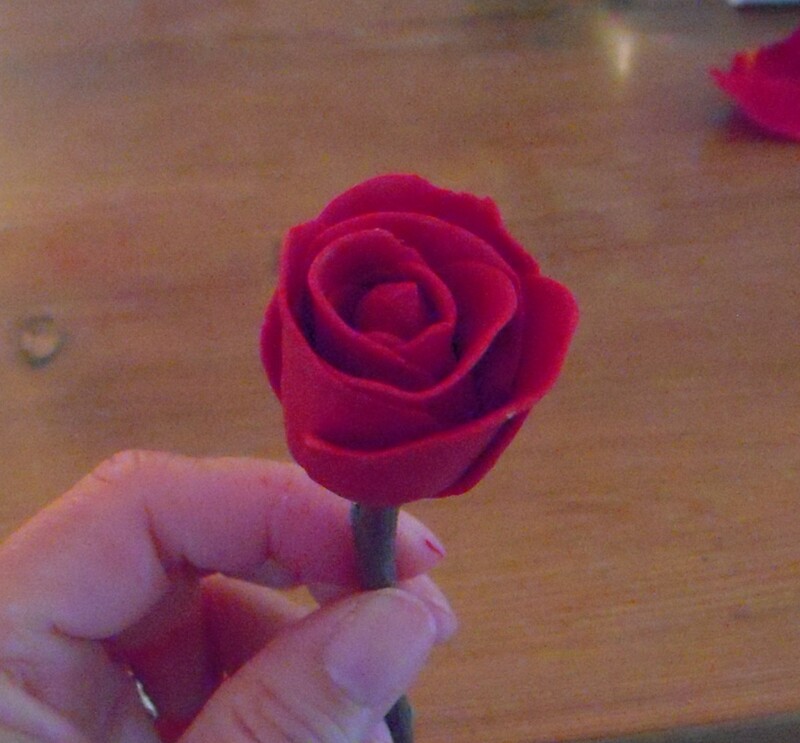 So easy that this would be a great craft for any large group. 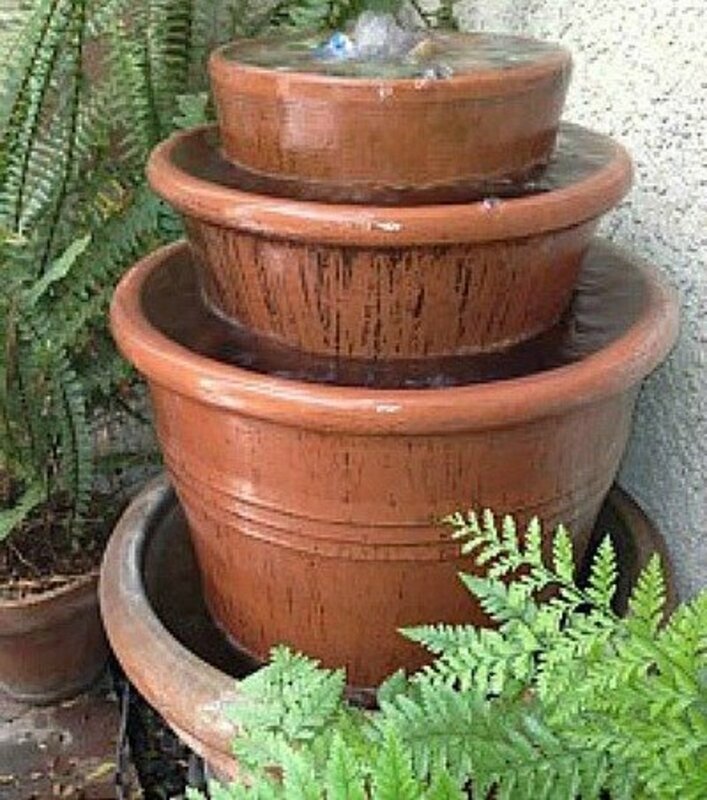 Make this clay pot water fountain, place it in a pretty garden spot and listen to the soothing sounds of falling water. Flying Kitten shares the directions for making this easy to make clay pot fountain. These are just too precious. 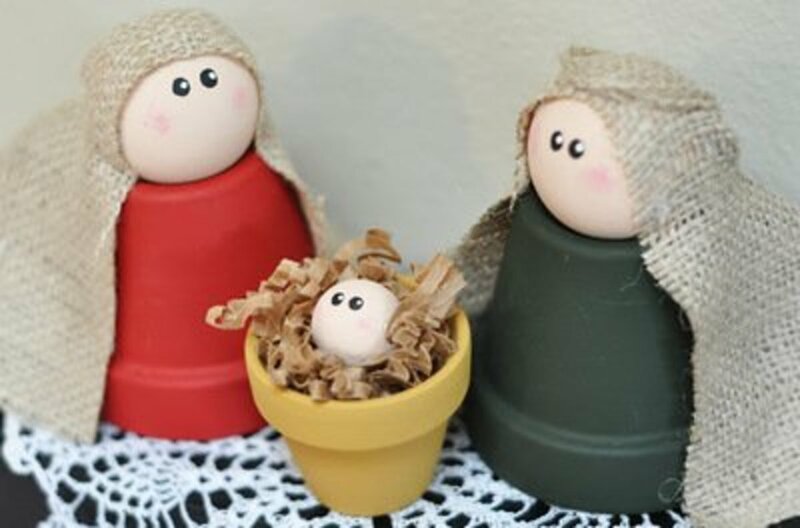 The directions for making the nativity can be found at Craftily Everafter. 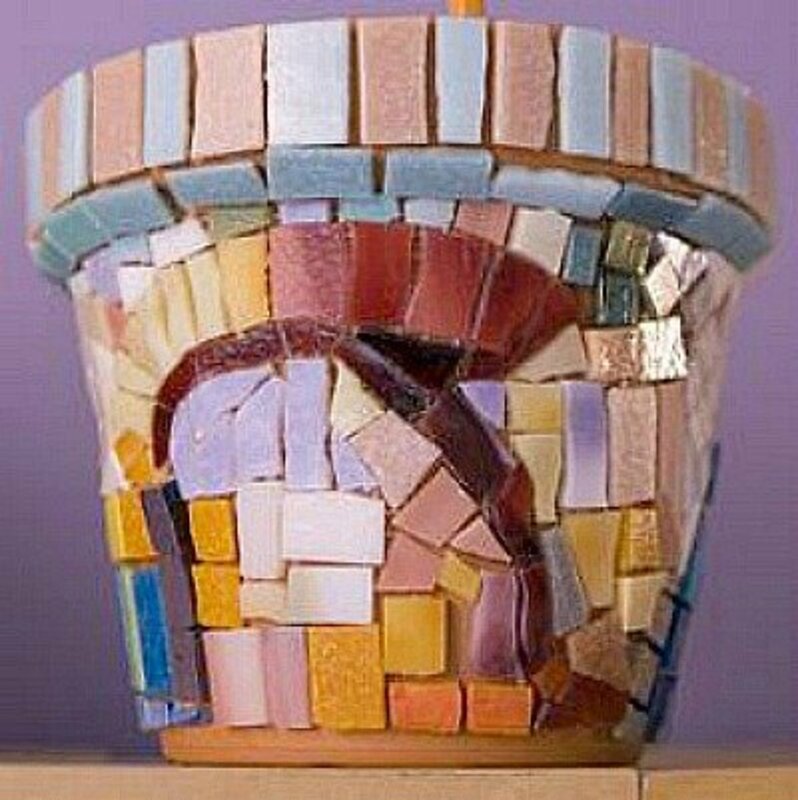 Use broken tiles, crockery, shells, beads and charms to make a unique mosaic flower pot. 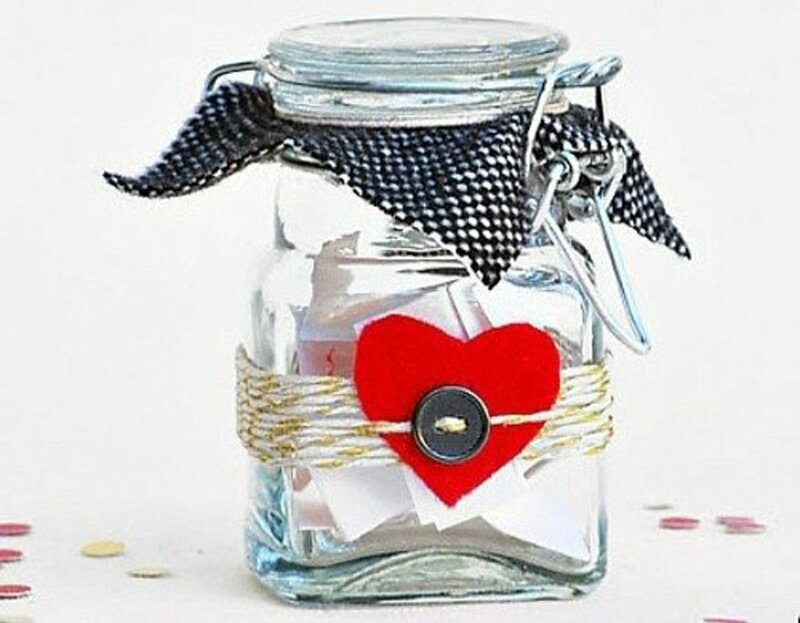 See how to do this craft project by going to lovetoknow crafts. What would Thanksgiving be without a Pilgrim couple to help celebrate? 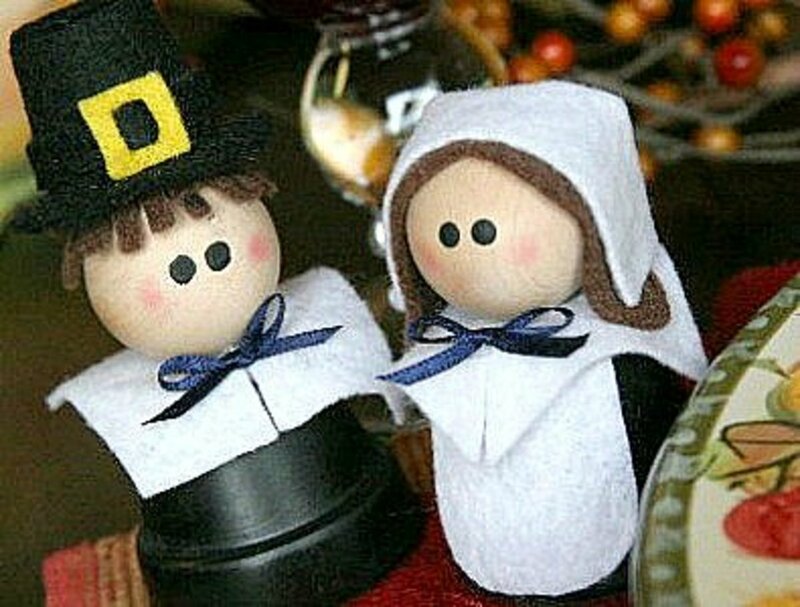 Add a clay pot pilgrim couple to your Thanksgiving centerpiece. Find the instructions to make them at CHILDMADE. I love this bird bath; with its white color and the white rocks in the water. Find the instructions for making this project at Hide and Moore. 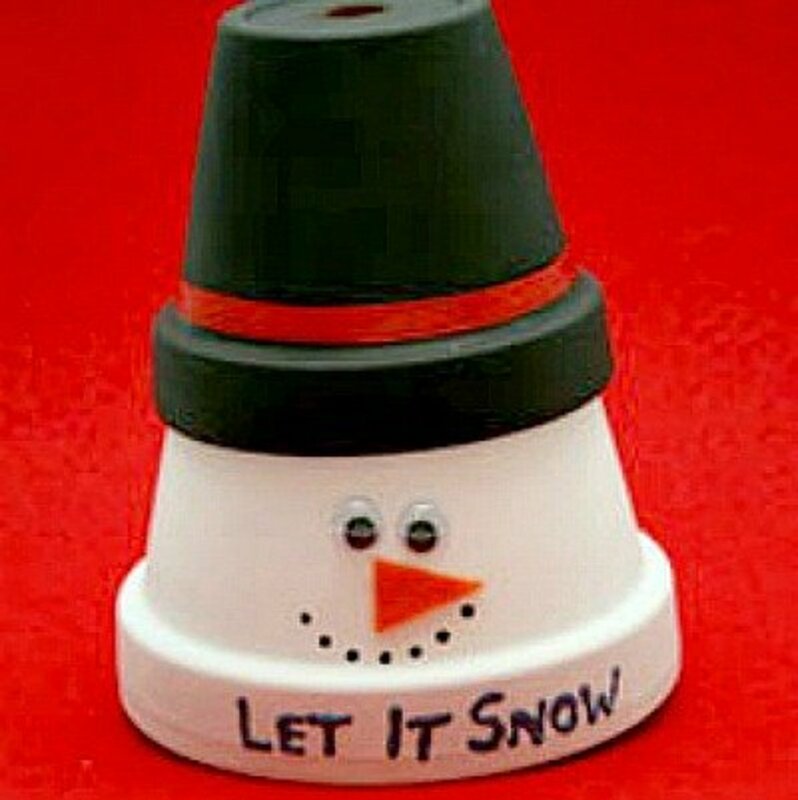 Use the tiny clay pots for these snowmen and use them to decorate your Christmas packages. You'll think of lots of uses for these cuties. Go to my cup runneth over for the instructions. 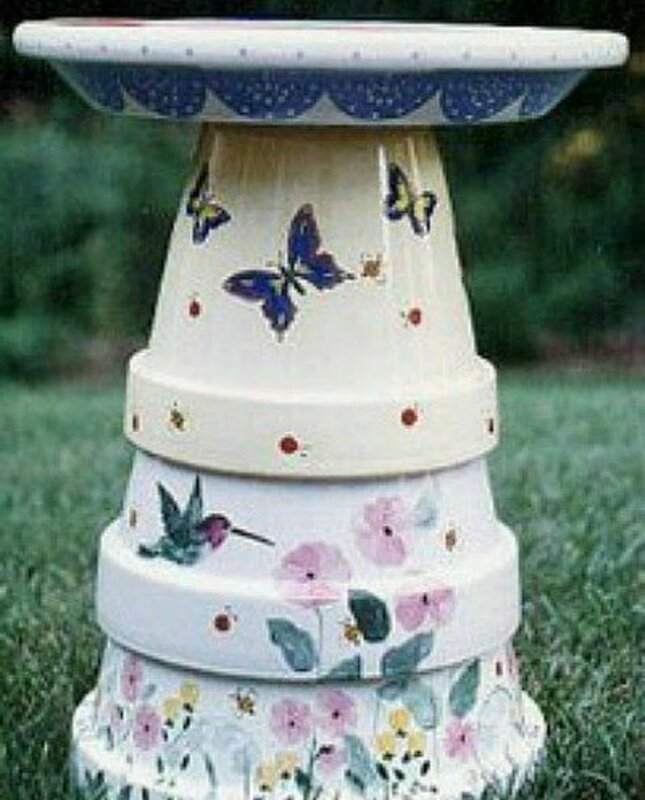 Flower pots decorated like this would really brighten up the patio, or to use as a party decoration. 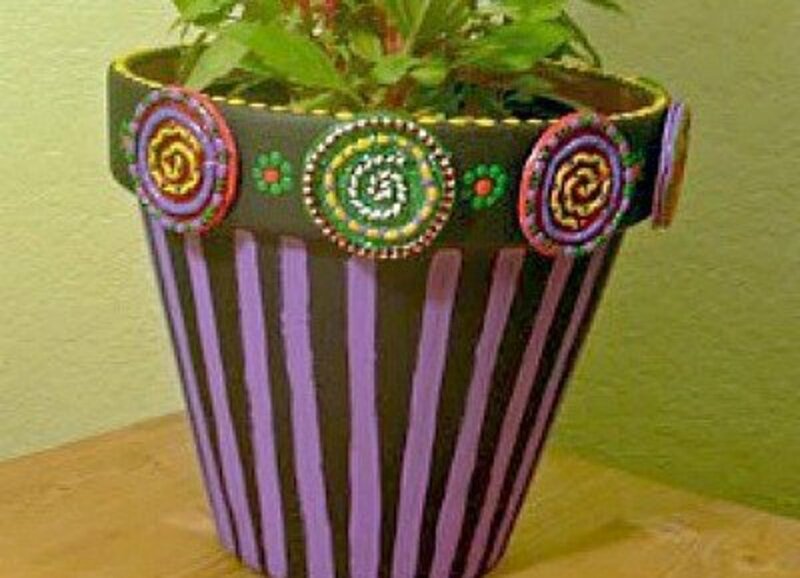 To make beautiful fiesta flower pots like the one shown above, go to I LOVE TO CREATE.COM for the tutorial. 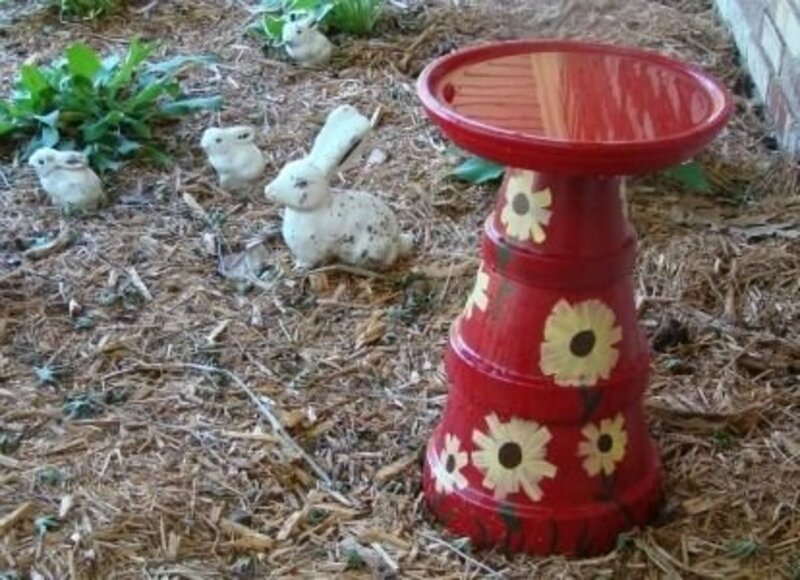 You'll find easy to follow directions for making this bird bath at Two Men and a Little Farm. Included are important tips on making the bird bath weather proof. Christmas wouldn't be the same without all of Santa's helpers and his elves. 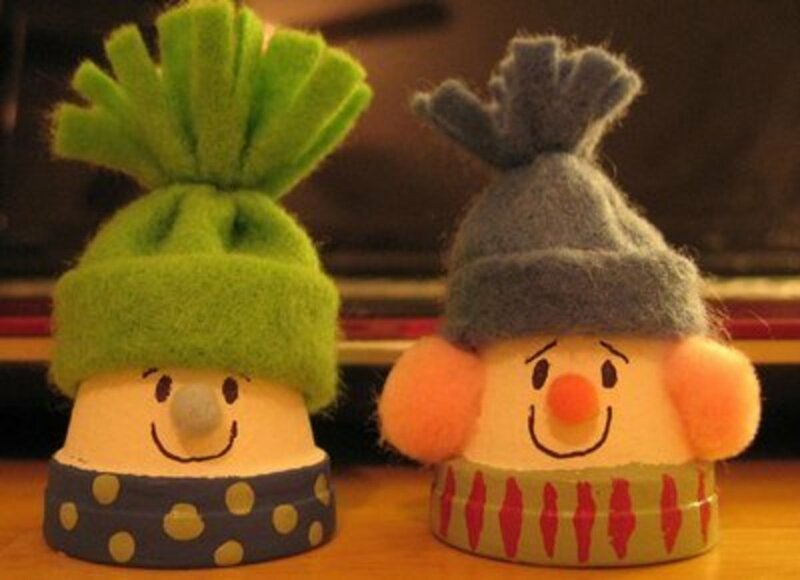 Make clay pot Christmas elves by following the directions at FAMILYCORNER.com. 41. Clay Pot Village - This is a Xmas Village, but how about a Fairy Village? This scarecrow is way too cute to be considered scary. 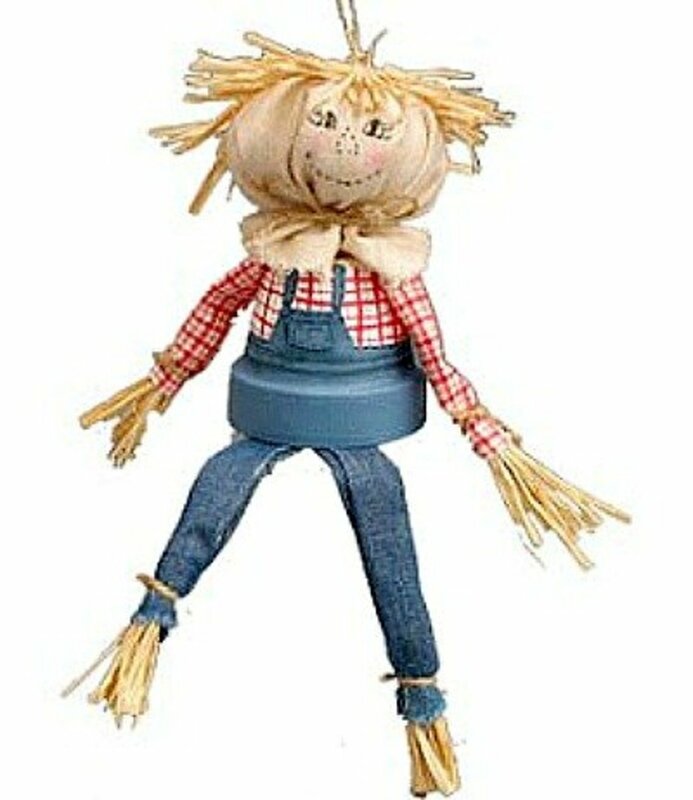 You'll have so much fun making this scarecrow and hanging him where everyone can admire him. The tutorial for making this project can be found at FAMILYCORNER.com. 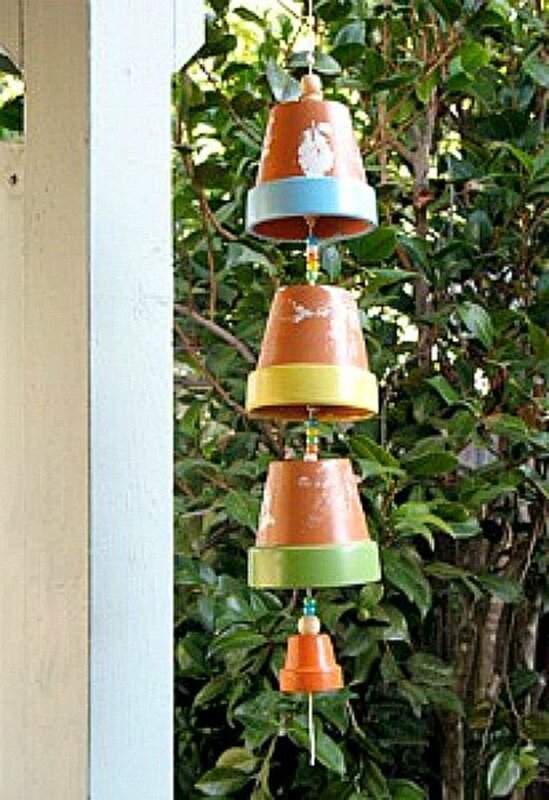 It looks like the creator of this project felt a little tipsy, but the stacked flower pots are such an attractive garden accessory. It's so much fun to make something a little different---something that makes an item unique. 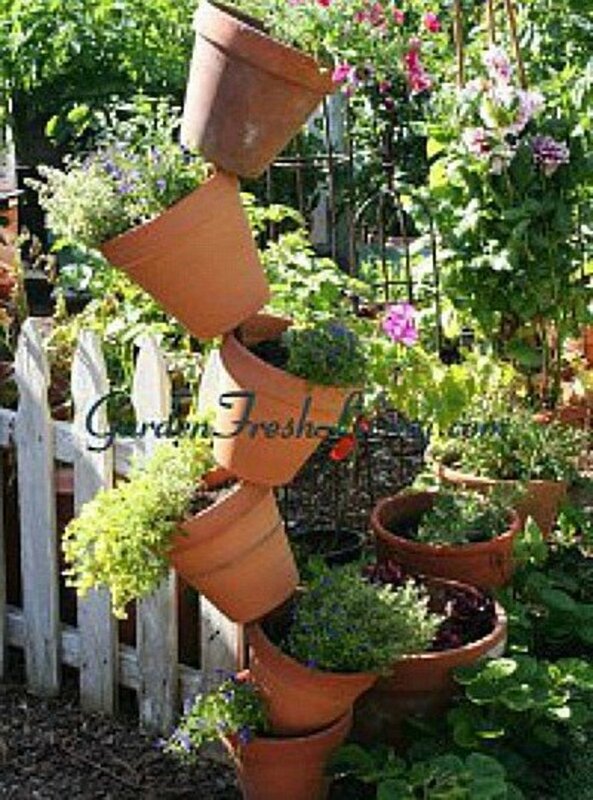 To see how to make this great stacked flower pots project, go to LIVING HOMEGROWN. Love this look!! 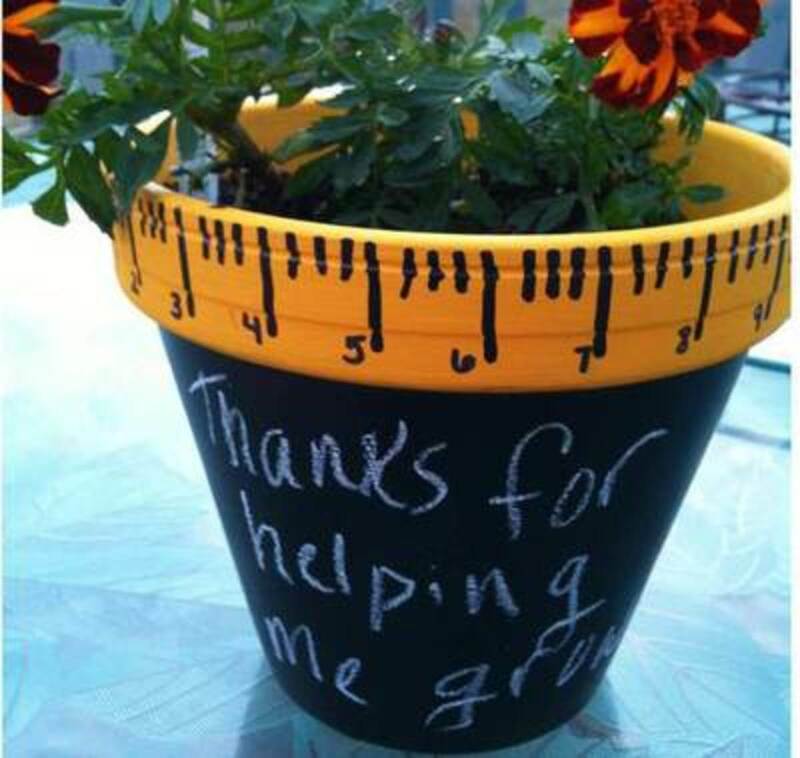 Let the teacher know how much she, or he, is appreciated by making and giving them a beautiful homemade gift. See what supplies you'll need and the instructions to make this gift at A Walk in my Flip Flops. 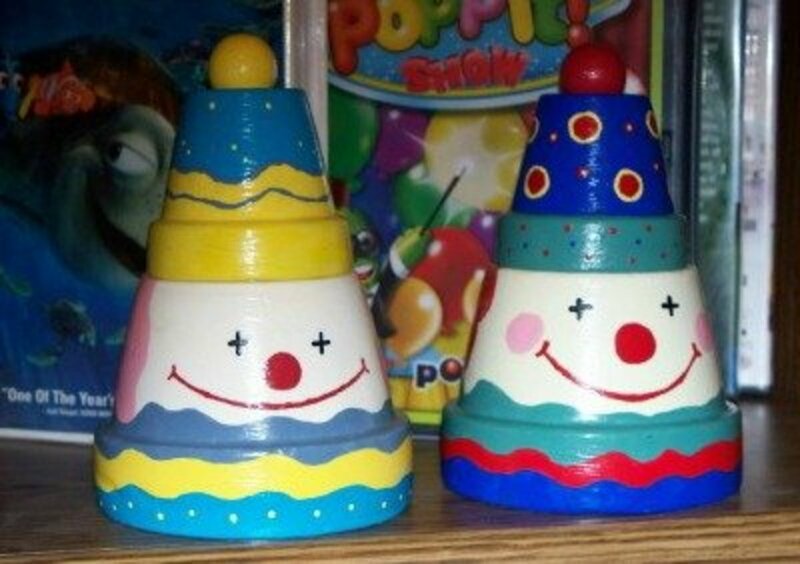 Wouldn't these little clowns be a cute addition to a baby's room or a small child's room. 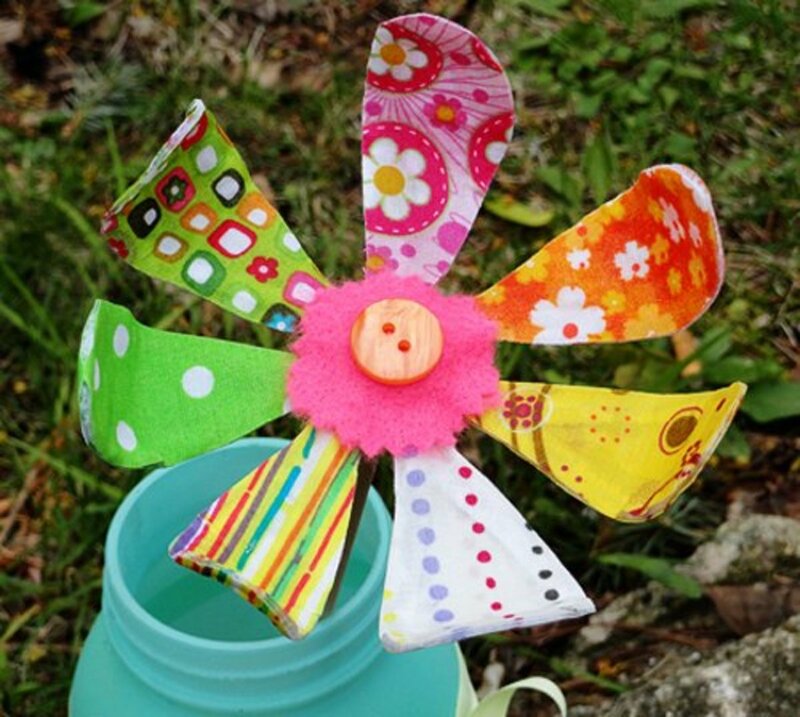 They are so bright and cheerful looking that they'd make a cute theme for a birthday party or a baby shower also. Find the tutorial for making these clowns at favecrafts. 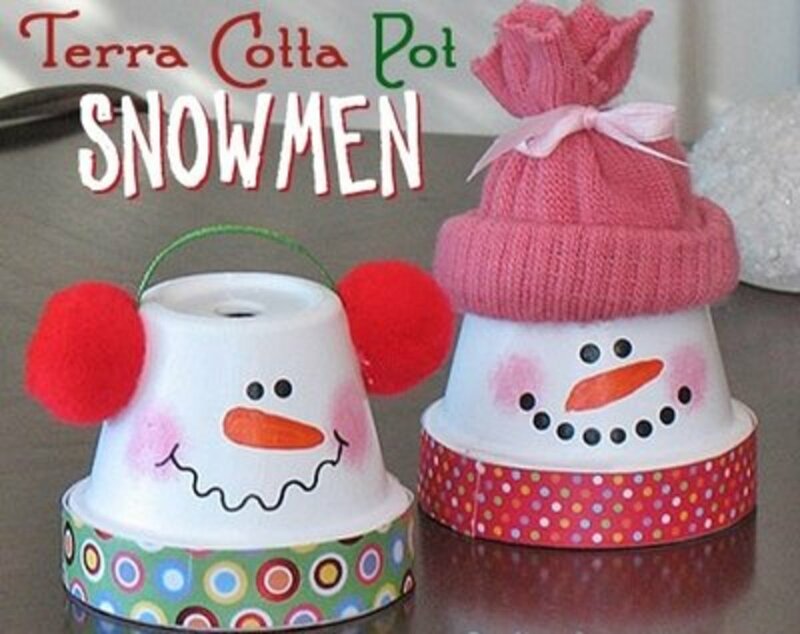 Another version of terra cotta or clay pot snowmen. The instructions for this snowman project are found at Homedit. 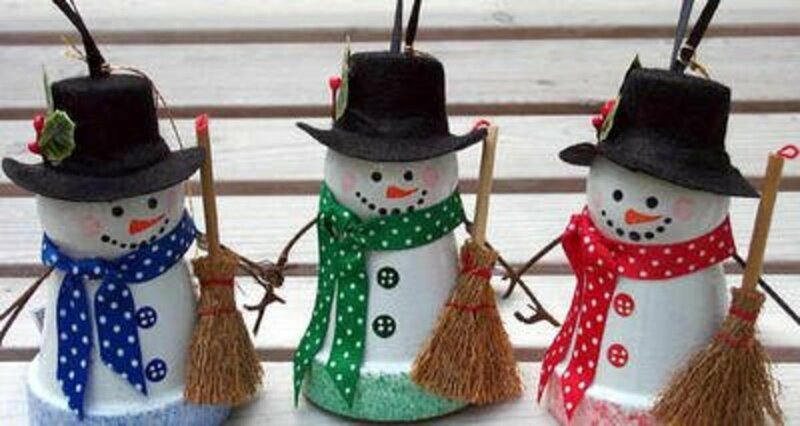 Just another really cute way to make snowmen. 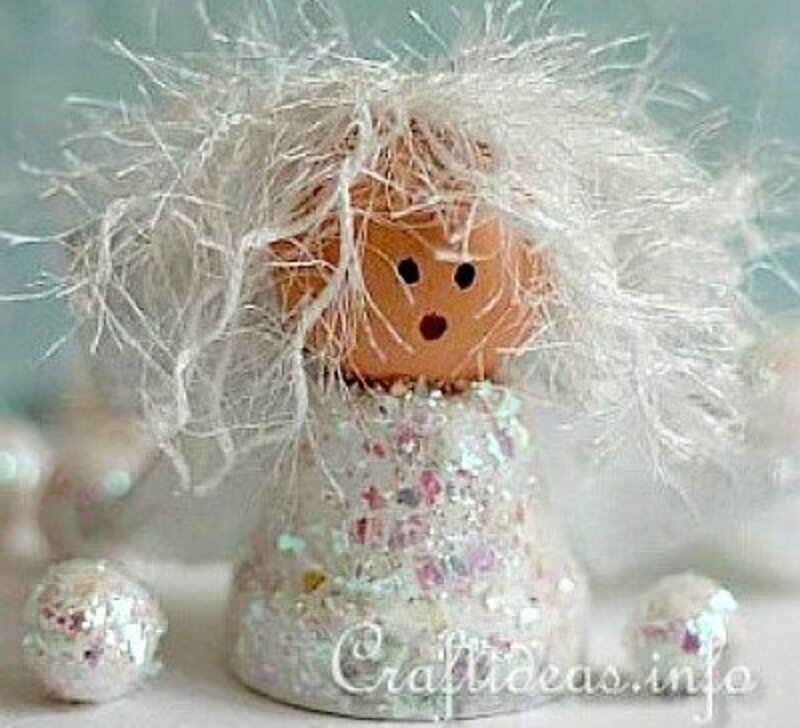 A real cutie patootie angel made using a clay pot. The directions at Craftideas.info tell how to make this little beauty. 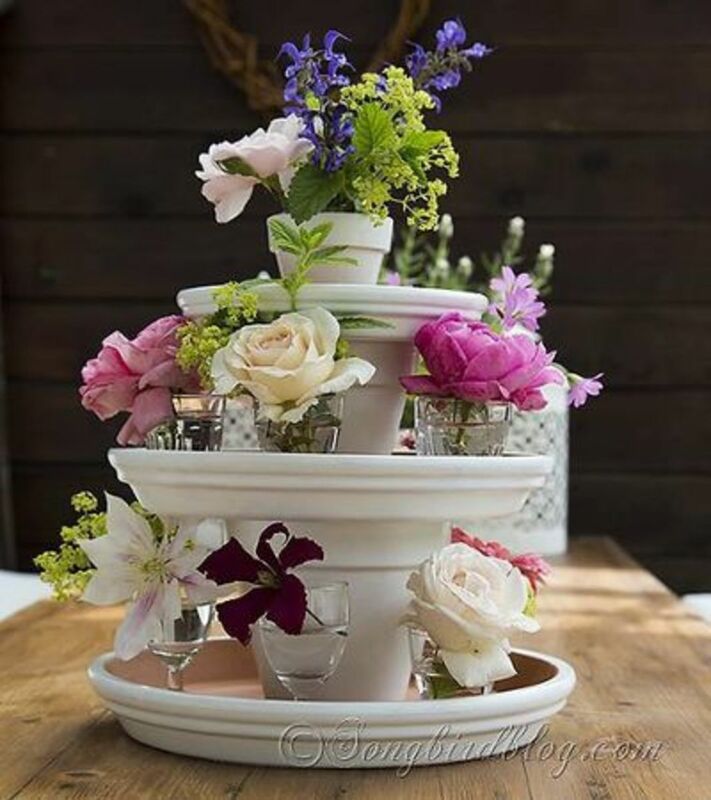 Display a cake or cupcakes on a beautifully simple cake stand made with a clay pot and saucer. The easy directions for this project are found at Hello MY SWEET. This is probably the simplest snowman to make, so it would be a great decoration if you need to make a great number of them for a banquet or party. You'll find the easy directions at All Kids NETWORK . Many folks decorate with toy soldiers at Christmas time. I have never used toy soldiers to decorate for Christmas, but these little fellows are so cute that I may have to make a couple. 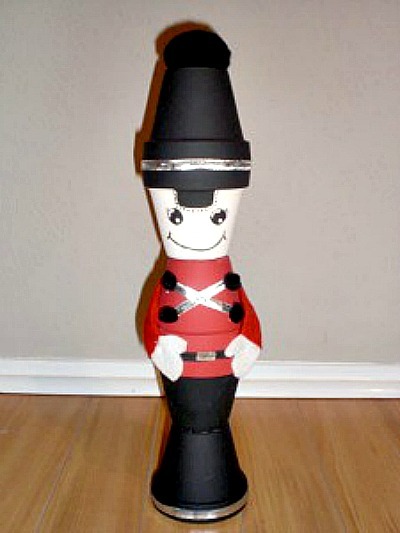 You'll find the instructions for making these toy soldiers at AboutChristmasCrafts.com. The little top hat really makes this little turkey special. Tuck a few cute little turkeys on tables and shelves to add to the Thanksgiving festivities. 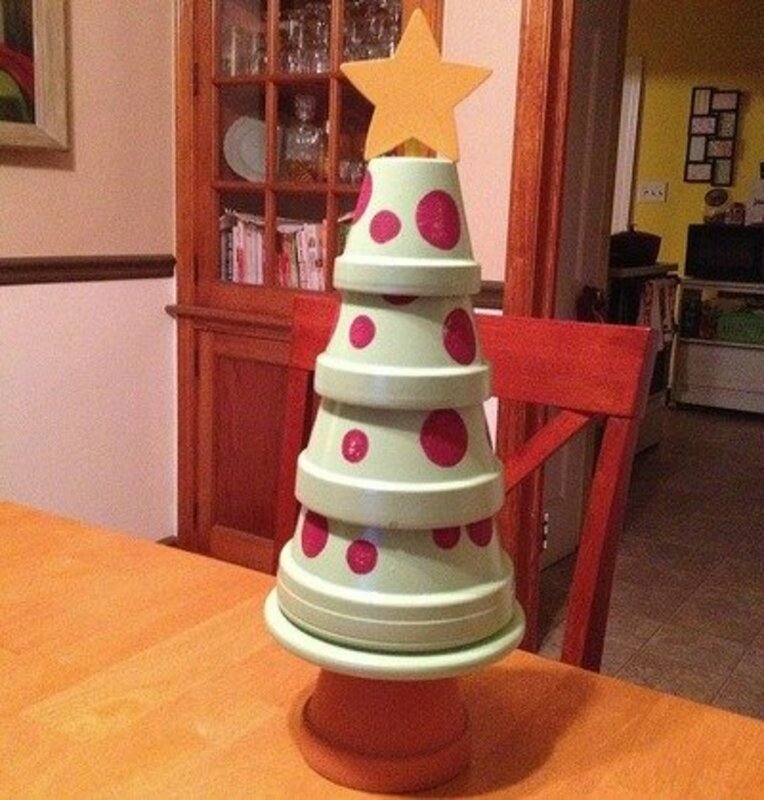 You'll find the easy instructions for this craft at JUST BUILD STUFF. 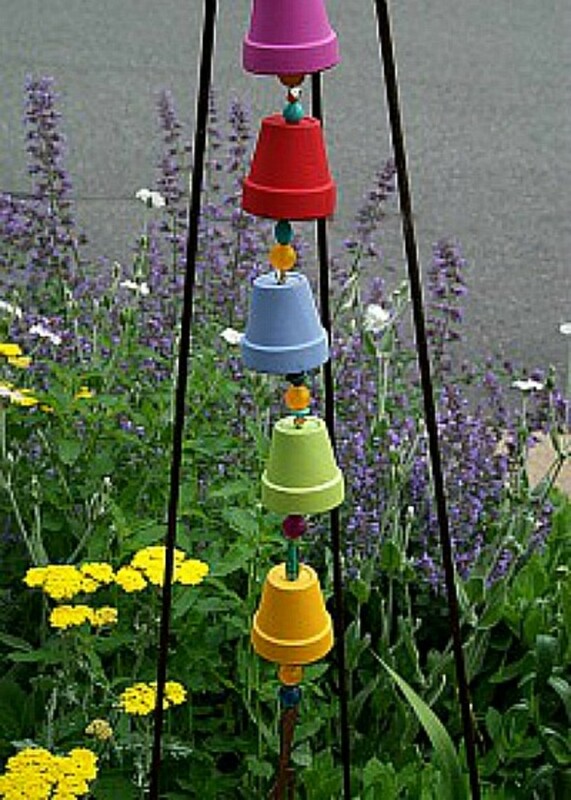 The instructions at LETS'S EXPLORE tell us how to make these flowerpot wind chimes. 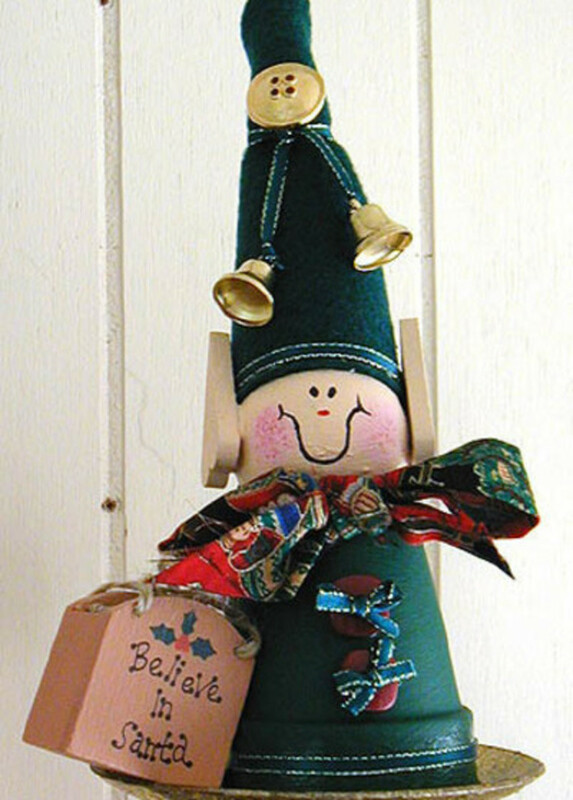 Help the kids make Grandpa and Grandma wind chimes like these. I know they'll like them....I would. 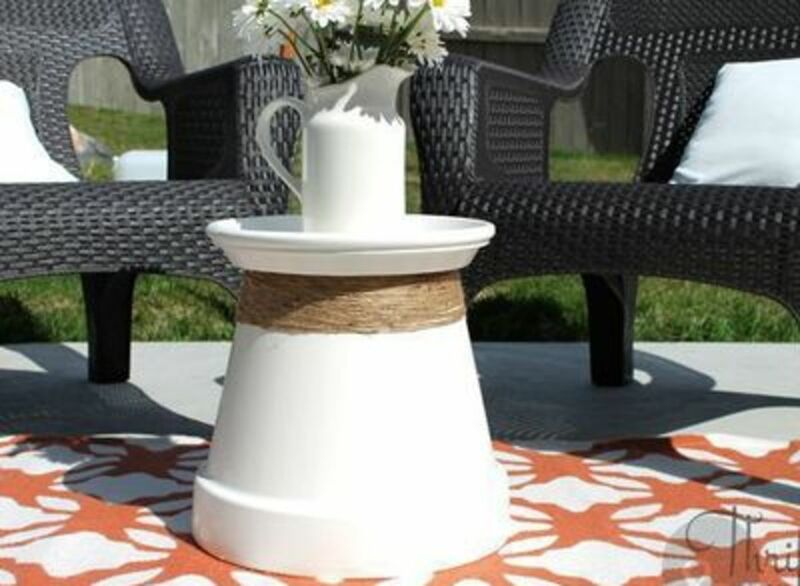 You can make this attractive and useful accent table by following the instructions at Home Talk. 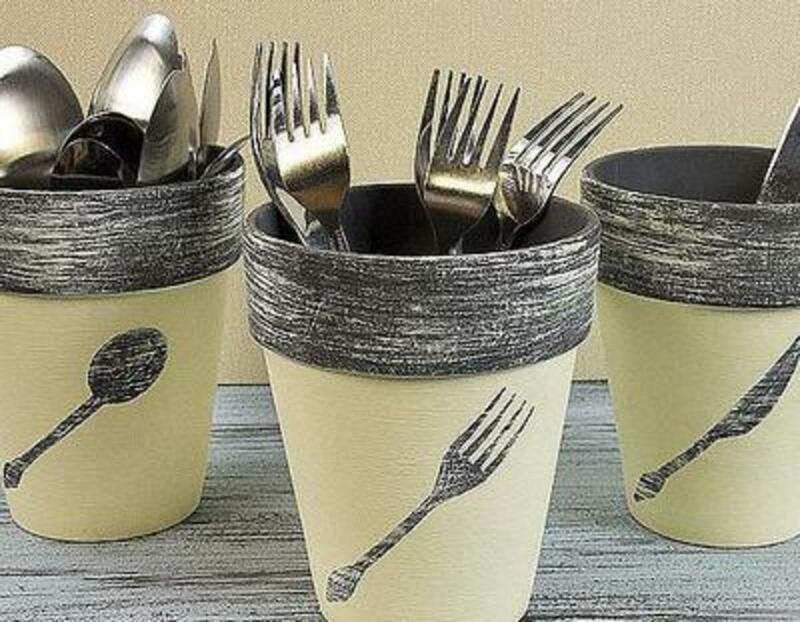 Make your picnic or patio table attractive with these clay pot utensil containers. The tutorial for this project is at Deco Art. 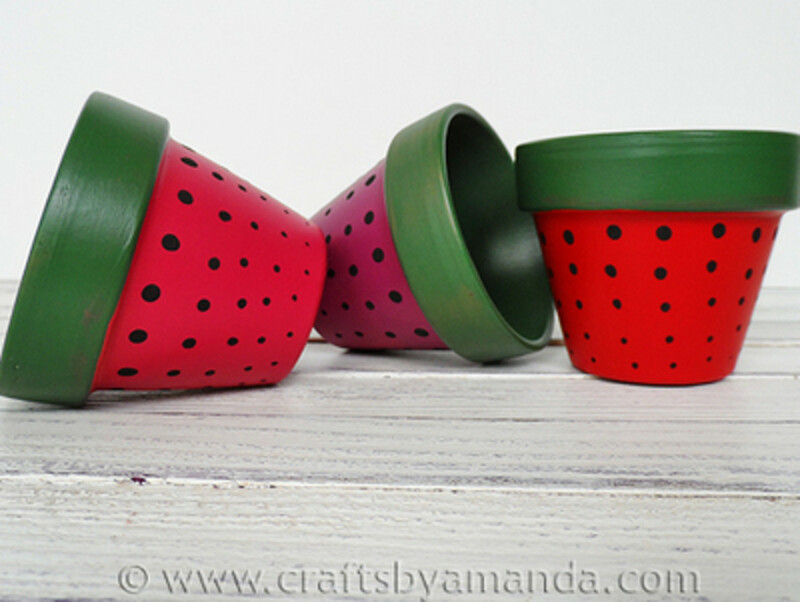 If you love strawberries and like to decorate with them, here is a great idea for you. 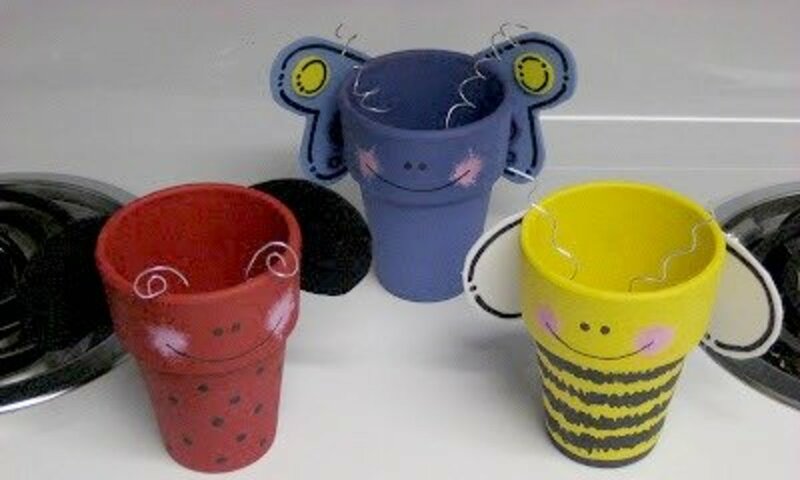 Find the directions for making these cute pots at Crafts by Amanda. 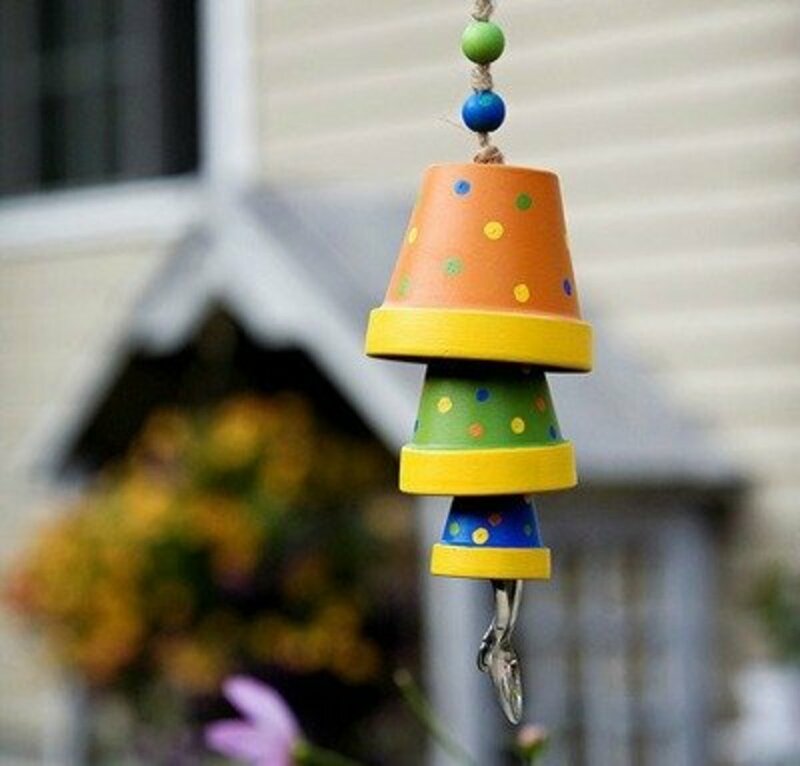 You'll find the tutorial for making this wind chime project at House of Joyful Noise. 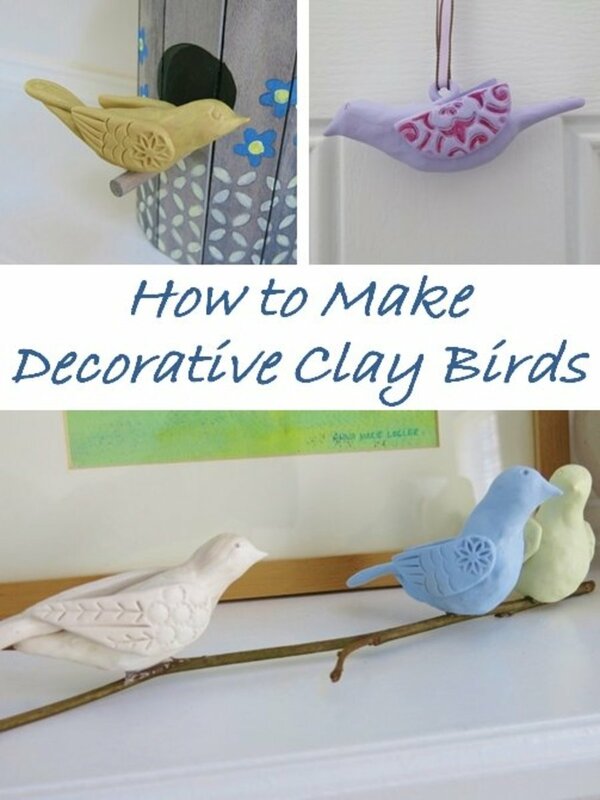 What Sort of Clay Pot Crafts Have You Made? - or leave a comment. I made a Ladybug housiie, a bumble bee house, and a whole Christmas Village, about 14 years ago. the Christmas village was the most fun. I had a x-mas tree, a town full of Elves, all different sizes, a Snowman, a Rudolph reindeer, Mrs. Claus, and of course terracotta pot houses and santas workshop. I just recently tore it down, and recycled the pots for my next project. Great inspiration! Thanks for all these projects compilation. Loved the tier trays! 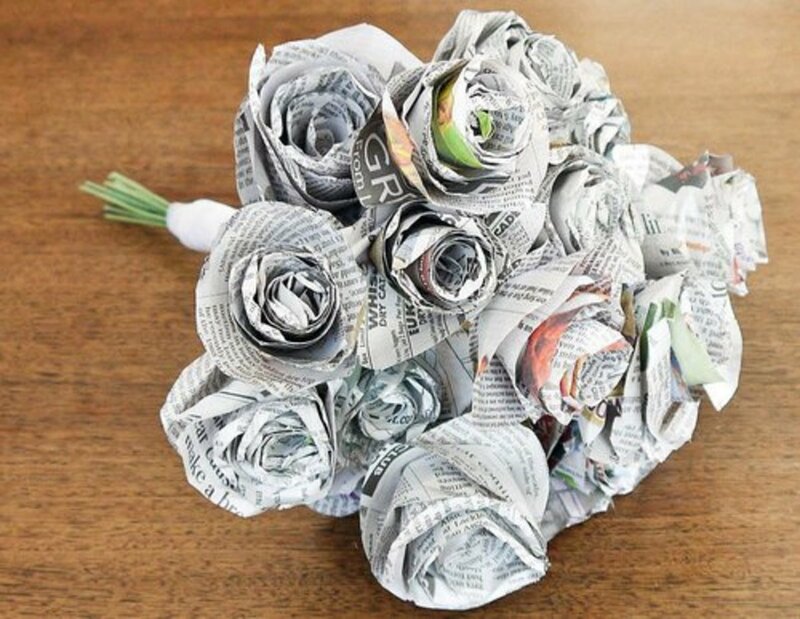 Super creative! I am COMPLETELY in love with these!! You have brightened my day!!!! !